Birds have been awarded runners-up at the prestigious Leicester Square Theatre Sketch Off! 2019 competition. The sketch group, who also reached the final stages of the competition last year, went one step further this year by placing in the top three acts. Almost 80 sketch groups and character comedians from across the UK took part in the competition, which kicked off with a series of heats and then four semi-finals at London’s Museum of Comedy. The final of the competition was held at the 400-seater main auditorium of the Leicester Square Theatre. 10 of the country’s best up-and-coming acts strutted their stuff on stage, and after a fun-filled night, Birds were placed third. You can find reviews of the night’s events by Steve Bennett on Chortle and Bruce Dessau on Beyond the Joke. 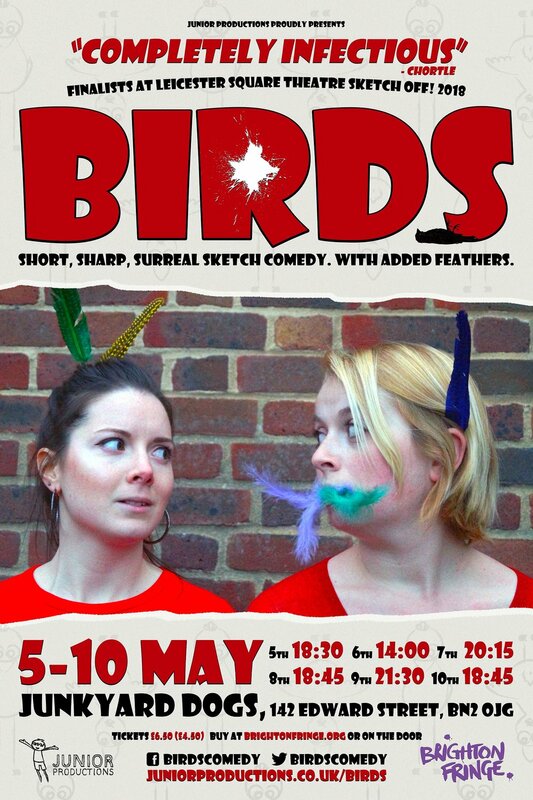 Birds can next be seen at a number of sketch comedy nights across London - including Sketchy Ladies in March and Belly Laughs in May - before heading to the Brighton Fringe to perform brand new one-hour show “Pluck”. Tickets for the show, which runs from 3rd-4th and 29th-31st May, are available on the Brighton Fringe website. Hot on the heels of the sketch group's successful shows at Brighton Fringe Festival and Prague Fringe Festival this May, we're delighted to announce that Birds have been shortlisted for the prestigious BBC New Comedy Award. From a pool of more than 600 UK-wide entries, Birds were selected to take part in the heats of the competition. Birds performing live at the Prague Fringe Festival. The event takes place at London's Up the Creek comedy club on 26th June 2018, with each act performing a five minute set. The winners of each individual heat will then progress through to the semi-finals, which will take place in Edinburgh during the festival in August. Highlights from all of the heats will be broadcast on BBC Radio 4 Extra. We are delighted to reveal that our brilliant comedy sketch group Birds has been selected as a finalist at the 2018 Leicester Square Theatre Sketch Off contest. Around 90 sketch acts from London and all across the UK entered the heats of the prestigious sketch comedy competition, which took place at the Museum of Comedy over several nights throughout February. Birds, which is performed by Amy Spinks and Leila Nashef and written and directed by Will Noble and Joe Reaney, advanced from their heat to one of four semi-finals, also at the Museum of Comedy. Then, last night, they progressed again to reach the grand final, to be held at the Leicester Square Theatre on Sunday 25th March. There will be 10 superb sketch acts competing in the iconic 400-seat auditorium, with a cash prize and showcase up for grabs, so why not pop along? Tickets are available for £15.50 from the Leicester Square Theatre website. Find out more about the event on the Sketch Off Facebook page, then book your tickets through the LST box office. And you can keep up to date with all things Birds on our own Facebook page. Following our storming (citation needed) debut shows at Diminishing Returns, Comedy Virgins and Party Piece in September, Birds is back. Are back? Is back. We've got brand spanking new comedy sketches, and we'll be premiering them at the absolutely legendary London comedy venue Downstairs at the King's Head. On Thursday 9th November, you can see a new five-minute Birds set at the venue's famous Try Out Night, launchpad of some of the UK's biggest comedy stars. Doors open at 8pm and tickets - on the door - cost just £4. That's less than the price of a beer. Bloody London. The Try Out Night has been a fixture on the UK circuit since 1986. There will 16 comedy acts on the bill - a mix of new acts and old hands, sketch and stand up - with each doing five minutes. All MCed by comedian Matt Green. So come along. It'll be a laugh - promise. Oh, and it's usually a sell out, so arrive early to avoid disappointment. P.S. Can't make it on 9th November? Don't worry. You can also catch Birds at Party Piece on 21st November. Find out more about the Try Out Night on Thursday 9th November here. The Man Who Stopped, a short film by writer and director Joe Reaney, scooped top prize at the Direct Monthly Online Film Festival (DMOFF). The festival shortlist, created by a diverse jury of industry specialists, was announced in September, and included everything from feature films and documentaries to music videos and web series. Awards were announced in early October, with The Man Who Stopped picking up the Best Film. It's the fourth major award for The Man Who Stopped in 2017, following wins at Top Shorts, TMFF and East Coast Film Festival. The film has also been an official selection for a range of major upcoming film festivals, including the Crystal Palace International Film Festival, Manchester Animation Festival and the Winchester Short Film Festival. You can see the full list of DMOFF winners here.